Winter is the time of year that the travelling bream move along the beaches. One of the best naturally found baits for bream is the humble pipi, so today’s tip is around finding pipis on the beach. Pipis aren’t always in the same place , no matter the tide, they move up and down the beach from the waterline (intertidal zone) up past the high water mark. Pipis are affected by various weather conditions and move accordingly. 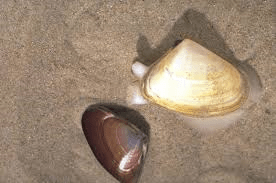 Tip is if you can’t find the pipis at the water mark with your feet then move up to the soft sand and dig, in the softer sand they are buried deeper but are much easier to get out. Of course 50 pipis per person and to be used on the beach- Open the pipi with a knife from the small side ( see above the side with the 2 small tubes protruding) this will ensure the bait piece is not damaged by the knife when opening.